Well as I mention in a previous post, I said I was working on a design refresh of my company site – Mad Scientist Technologies. After working on a completely new design (MST v2), I have decided to create and release a interim version. The interim version has been christened MST v1.3 – don’t you love how a original my theme’s names are, so lets dive in. If you have done any work with software you can guess that this interim theme is just an refining of the previous theme (MST v0.9.2) which is eighty percent true. 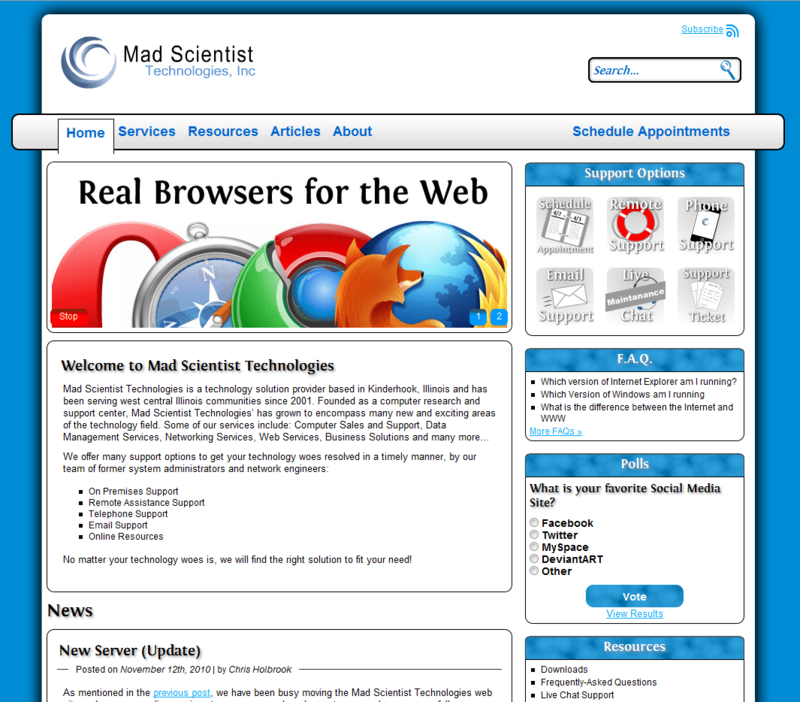 Lets take a look at the current theme that Mad Scientist Technologies is still wearing from November 2009. Now that I have rambled on about how bad the first design of my company site was, it is about time I share a sneak peak at the new interim design. Hmmm, but how much should I show? Should I show the entire thing…Nah? … I know! As you can see from the sneak peak, the theme has retained the same look – but it has been refined. The colors has been simplified, the support option icons have been updated, the slider is still there, and a few items have gone the way of the dodo. That wraps it up for this first installment of ‘Mad Scientist Technologies’ Refresh,’ check back soon for more updates about the upcoming changes that occurred under the hood and eventually the big redesign sneak peaks. Constructive criticism is welcome on the new design, please sound off in the comments.